Dr. Lindsay Portnoy leads a class in early childhood development at Hunter College in New York, during which her students use devices to take notes. Does Using Technology in the Classroom Help or Harm College Students? Almost anywhere in the world, you are likely to find people doing the same thing at eateries and in other public places, on trains and buses or wherever else you look. More and more people spend their day looking at laptop computers, smartphones or other personal electronic devices. They are thinking mainly about their electronic devices, and not much else. The same can be said about the world of higher education. 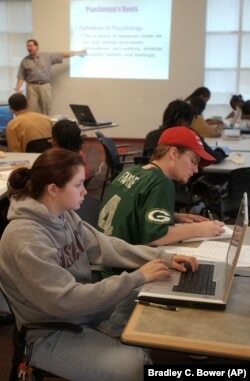 More and more college students have no problem walking into a classroom and immediately opening their laptops. Others may spend an entire study period with a smartphone in hand. Arnold Glass is a professor in the School of Arts and Sciences at Rutgers University in New Brunswick, New Jersey. Glass and a student researcher investigated the issue of divided student attention. They reported their findings in July 2018 in the publication Educational Psychology. The study involved 118 Rutgers students who were taking the same upper level college class in psychology. The students were permitted to use any electronic device as much as they wanted during half of their daily class periods. During the other half, researchers closely watched them to make sure no one was using any technology. Harrisburg University student Kelsey Collins, foreground, works on a computer which is wirelessly connected to her professor's laptop presentation data. The students’ academic performance was measured in several ways throughout the semester. The students took a short test every day, longer tests every few weeks and a final exam covering all the class material. The researchers found that the average daily quiz results showed no evidence of harmful effects from the use of technology. However, the average results of the larger tests and final exam told a different story. They showed that all the students performed poorly on questions covering material taught on days when they were permitted to use technology in the classroom. It did not matter whether or not the students reported that they had actually used a laptop or cellphone on those days. This is by no means the first or largest study to look at this issue. Still, Glass argues that it shows the use of electronic devices in the classroom prevents students from processing information. The students hear what the professor is saying. But they might be buying things online or reading unrelated emails at the same time, for example. So they are not thinking deeply about the subject matter as they are hearing it. And that, Glass says, makes it harder for the information to enter their long term memory. University of Michigan professor Kentaro Toyama says he has seen this problem progressing for years now. Toyama teaches classes on information technology at the university’s School of Information. So it was no surprise to him when many students started bringing laptops to his classes about 10 years ago. At first, Toyama thought it was a good idea as it could help students in their note keeping, or could quickly provide information during class discussions. But then he started noticing troubling behavior. At that point, Toyama decided to bar students from bringing laptops to his classes. Yet it was not a total ban. His classes often include activities that involve working with technology. So he says he only bans laptops during the lecture part of his classes, where he needs students’ full attention. Toyama says the ban is partial because he feels that technology can intensify both good and bad qualities in anyone. He notes that professors can make classes more interesting by using technology to present information in different ways. And there are many students who can listen, process information and investigate something online to add to discussions all at the same time. But even if technology is helpful to some students, there are times when it needs to be turned off, as it may harm others, he notes. In 2013, researchers at two Canadian universities reported that laptops not only harmed the academic performance of users. Students without computers were also distracted and, as a result, suffered academically. 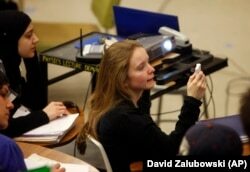 Gwyneth Glissmann of Boulder, Colorado, uses a special device to answer a question in the physics class of Professor Michael Dubson at the University of Colorado in Boulder, Colorado during his lecture. However, Lauren Margulieux argues that even Toyama’s relatively balanced way of dealing with technology represents a limited understanding of the issue. Margulieux is an assistant professor of learning sciences at Georgia State University in Atlanta. She says there are times in which classroom use of technology is completely unavoidable, as with students with disabilities. And in the current job market, students need to be able to develop the skills that will make their divided attention not only possible but successful. For example, at many modern business meetings, people might be talking, listening and operating a device all at the same time. So, Margulieux says, educators need to think about preparing their students to enter this quickly changing workforce. And in doing so, they may have to consider that something other than technology is distracting students. Traditional methods of teaching, such as a professor standing and talking in front of a class for an hour, may not be as interesting to today’s college students. In fact, the University of Michigan’s Center for Research on Teaching and Learning has created a special software program, called Lecture Tools. Students can use the program on their personal devices during a given class. It lets them inform the professor of how well they are understanding the course material. “Designing instruction in a way that gets students to engage with that material more would be a better solution than to ban laptops, because technology, in general, is not the only way that students find to distract themselves in class,” said Margulieux. She and Toyama agree that one other way of solving the problem may be technology itself. Special software already exists for online teaching and testing programs. It can be used to observe student activity on a given electronic device and prevent them from opening unrelated pages and programs. At the start of this school year, Purdue University in Indiana announced it would be using similar software in several of its lecture halls. This aims to prevent students from distracting themselves by blocking video services like Netflix. I’m Pete Musto. And I’m Lucija Millonig. We want to hear from you. How do you colleges and universities in your country deal with the distracting effect of technology in the classroom? Write to us in the Comments Section or on our Facebook page. Quiz - Does Using Technology in the Classroom Help or Harm College Students?